Orgone energy is a hypothetical form of energy proposed and promoted in the 1930s by psychoanalyst Wilhelm Reich, who originated the term to describe a universal bioenergetic force. Although beginning as a variation of the Freudian concept of libido, Reich ultimately came to see orgone as a massless, omnipresent substance, similar to luminiferous aether, but more closely associated with vital, living energy than inert matter. Orgone supposedly violated the second law of thermodynamics, coalescing and creating organization on all scales, from the smallest microscopic units - called bions in orgone theory - to macroscopic structures like organisms, clouds, or even galaxies. It was proposed it could be collected in specially designed "orgone accumulators" to be used as a form of therapy or in tools such as cloudbusters, devices intended to stimulate rainfall. Reich's follower Charles R. Kelley went so far as to claim that orgone was the creative substratum in all of nature, comparable to Mesmer's animal magnetism, the Odic force of Carl Reichenbach and Henri Bergson's élan vital. Reich created the Orgone Institute after immigrating to the US, and pursued research into orgone energy for more than a decade, publishing his own work through the institute and producing orgone accumulators and related devices for distribution. The U.S. Food and Drug Administration (FDA) eventually obtained a federal injunction barring the interstate distribution of orgone-related materials, on the charge that Reich and his associates were making false and misleading claims. When Reich violated the injunction he was jailed, and all orgone-related equipment and literature owned by Reich and his associates were destroyed. Orgone is regarded by the National Center for Complementary and Alternative Medicine as a type of "putative energy", a model which some therapists use for clinical procedures but which is untestable or defies measurement. According to writer K. Isaacs, the idea of orgone is a useless and discredited fiction. When I first read about orgone, I didn't take any notice. None of the facts about it made any sense at all, and I figured it wasn't worth researching. Orgone is so unussual, that it cannot be compared to conventional energy, and therin lies the confusion! It is not a gas, or a form of electricity. It is an invisble, massless energy that is not understood by mainstream science. The irony about orgone, and the one important point that most people don't realize, is that it accumulates in HHO-WFC cells. Metal plates submerged in water with electrical current attracts large amounts of orgone. Therefore all HHO generators are also orgone generators! The orgone is not made in the cell, but the orgone is drawn in because it has a huge affinity for electrically charged water! 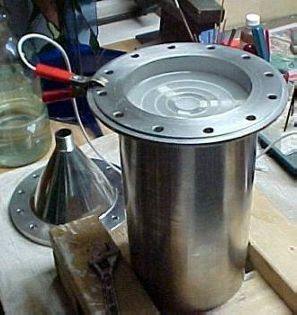 We cannot have an HHO generator without also generating orgone. This fact alone can explain why there are so many anomolous results that occur when you experiment with a WFC. The orgone, after being collected in high concentrations, tends to bleed off into the engine. It also affects the electrolysis process, perhaps supercharging it to overunity levels via a mechanism we don't fully understand. Quite simply, the orgone may enhance the electroysis process because it adds a form of electrical energy to the process. 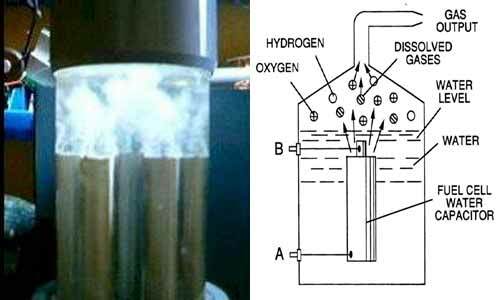 The affinity of orgone to electrically charged water goes a long way towards explaining why Stanley Meyer was able to get tremendous hydrogen using round tubes. These round tubes channeled and utilized orgone better than flat plates. His circuity and his unique configuration must have allowed orgone energy to perform work. Orgone accumulation is an important point that most people haven't learned about when the studying the WFC. When a person uses HHO to power a vehicle, it is quite possible that a huge portion of energy comes from orgone energy, not just from the hydrogen alone. Since Stanley Meyer's cell seems to be similar to a Joe cell, it is safe to assume that Meyer may have tapped into the same type of energy.